The dining restaurant at Sofitel Ambassador Seoul "Café de Chef" offers a special business lunch set, "Special Business Lunch Set" affordably priced at 20,000 ~ 40,000 won. As the main restaurant of Sofitel Ambassador Seoul, ‘Café de Chef' displays a fine selection of dishes from all over the world including Korean, western and even fusion cuisine. Designed by one of the top interior design specialists, LRF, the restaurant impresses its guests with an ambiance for comfortable dining. The private dining rooms are available for business dining as well. 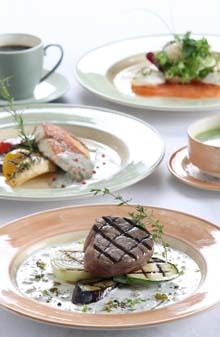 The special business lunch set has three sets to choose from and features only the most popular dishes that business guests have chosen. All sets include complimentary coffee and tea along with the main dish and appetizer.